Purely Dorset is a family run business which was started when Phil and Julia (ie. father and daughter) decided there was an opportunity to market a premium pure wool product using Poll Dorset wool from the family farm. Julia had already begun a business designing and manufacturing bed linen in New Zealand, Crisp Home, and the wool bedding was seen as a perfect partner for her existing business. We are incredibly proud of our pure wool duvets. We believe they are a superior product and once you have slept with a Purely Dorset duvet you will not want to use anything else. We sell them solely online on this website as well as at the Crisp Home online store. As a boy Phil had a passion for breeding sheep. At just 14 years old he invested in 10 aged Border Leicester ewes from Canterbury to start a Border Leicester stud. With limited financial resources progress was slow to achieve the objective of developing a quality flock. Persistance prevailed and eventually a flock developed supplying 150 flock rams to the market. In 1964 Phil began exhibiting at local shows to benchmark his animals alongside other breeders. 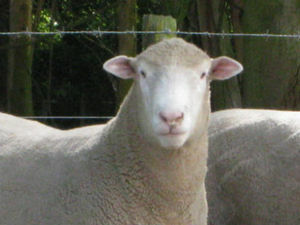 The ultimate was achieved in the 1980's when the Ram was bred using the best South Island genetics. This ram won 17 Show Champion awards including Royal Show Supreme Champion. However, with the reduction in popularity of the Border Leicester as a crossing breed due to significant improvement of the Romney breed, attention was given to the development of another flock. By far the most popular terminal sire in Australia was the Poll Dorset breed and it was gaining popularity with New Zealand lamb producers. The decision was made to purchase a complete flock of Poll Dorset ewes and over the initial 2-3 years other sheep were added to the flock. With the experience gained over the years and a more substantial investment, progress was rapid. Within 2 years the flock had bred a Royal Show Champion (see photograph on Home page) and others soon followed. The Ruataha flock has built a reputation for quality within the prime lamb market. In the last 10 years Phil has been joined by his two sons and the 3 of them together run 3 properties in Central and Southern Hawke's Bay. Phil continues to exhibit at local shows with his Ruataha Poll Dorset stud in partnership with his youngest son Leyton. The breed Poll Dorset is best known as a terminal sire breed. i.e. all lambs are grown for lamb meat production. But it's wool has special qualities which are not generally recognised. i.e. very high bulk/weight ratio. Unlike other sheep breeds the Poll Dorset fibre is very bulky and does not lose that characteristic over time, as well as this it does not have any black fibres. That coupled with its light weight made the wool ideal for duvet fillers and other bedding products as it has a high insulation factor relative to its weight.